The creators of legendary adventure game Myst are seeking cash for a new game via Kickstarter. 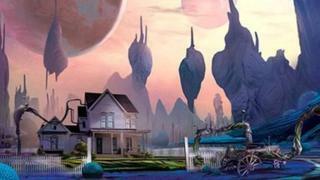 Cyan Worlds is looking for $1.1m (£679,000) from the crowdfunding site to develop a game called Obduction. The game-maker said its new title would be a spiritual successor to its earlier point-and-click adventure games Myst and Riven. If Cyan reaches its funding target it plans to release PC and Mac versions of Obduction in mid-2015. Released in 1993, Myst was a huge hit thanks to its sumptuous look, detailed world-building and intricate puzzles. On its Kickstarter page, Cyan said Obduction would continue with these traditions but update them to take advantage of the power of modern computers. It said the game would use the Unreal 4 game development engine to create a detailed far-flung world that players find themselves upon at the start of the game. Playing Obduction involves exploring the world, solving puzzles and working out why the player has been abducted and taken to the alien planet. The cash being sought was for the most basic version of the game, said Cyan. Cash raised beyond the original total would go towards making the game world bigger and moving the title to other gaming gadgets beyond PCs. Cyan said it was turning to Kickstarter because it allowed the company to connect with fans, meant it had control of development and ensured everyone involved had an intimate link to the project. Nathan Grayson at PC game news website Rock, Paper Shotgun said the "meagre" information provided by Cyan did not give a good idea about how the final game might turn out. He wondered if the game would reach its funding target despite getting pledges of more than $100,000 within a day of being kicked off. "Obduction really does feel like it'd be a shoo-in if it wasn't currently a pile of napkin scrawlings and a series of excited hand gestures," he wrote.